Prepare the base guacamole in a mixing bowl. Dress the guacamole with about 1 tablespoon lemon juice and combine. Add the apple into the guacamole, reserving 1 tablespoon or so for garnish, then stir in the chipotle in adobo. Mound into a serving dish and chill until you are ready to serve. When ready to serve, toast the almonds until very fragrant and deeply golden. Top the guacamole liberally and entirely with toasted nuts; garnish with the remaining apple. In Recipes-list.com we have selected the most viewed recipes from category - uncategorized . Enjoy the best recipes specially selected for you! 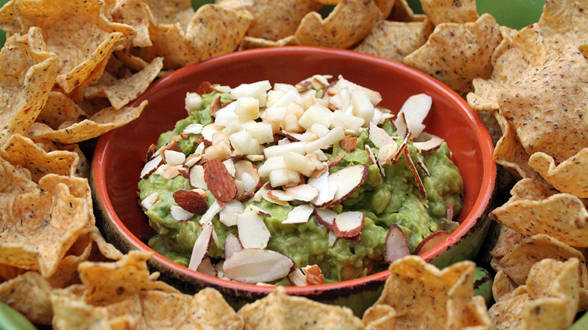 Apple and Almond Guacamole is the right choice that will satisfy all your claims.